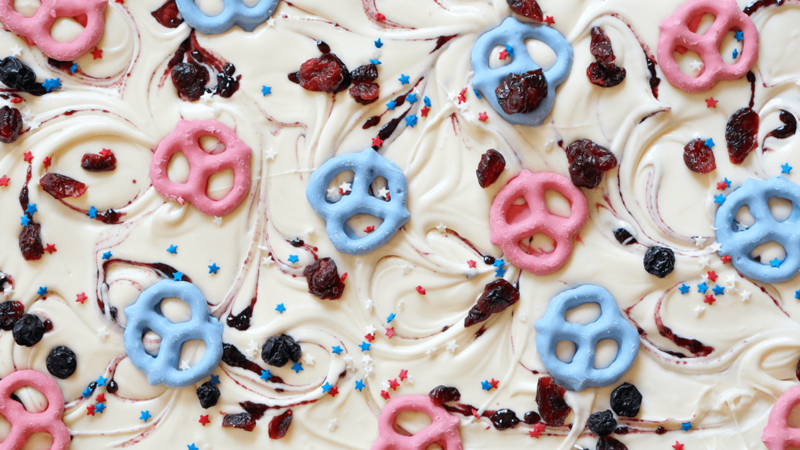 Our patriotic candy bark with pretzels and dried berries is a crowd favorite! Make ahead and keep in the fridge until ready to serve for a low-stress party snack. With summer in full-swing, we’re gearing up for the 4th of July. My family usually spends the holiday out on the lake, by the pool, or at the beach. Basically, anywhere near water. 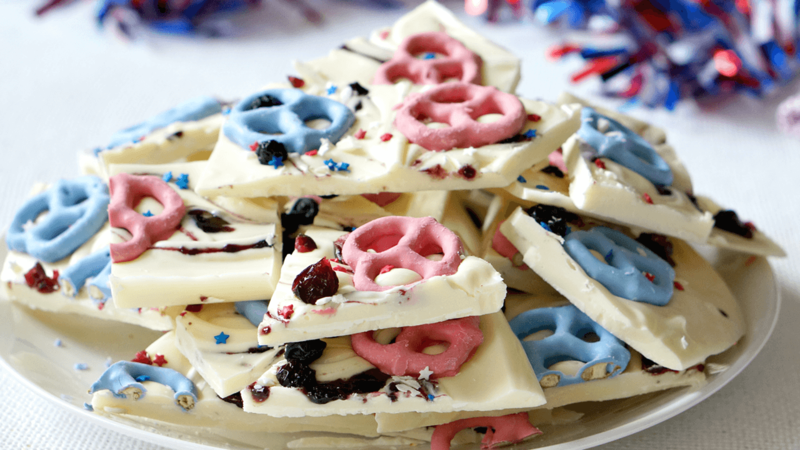 Wherever you end up celebrating Independence Day, you’ll want to bring this patriotic red, white and blue candy bark. 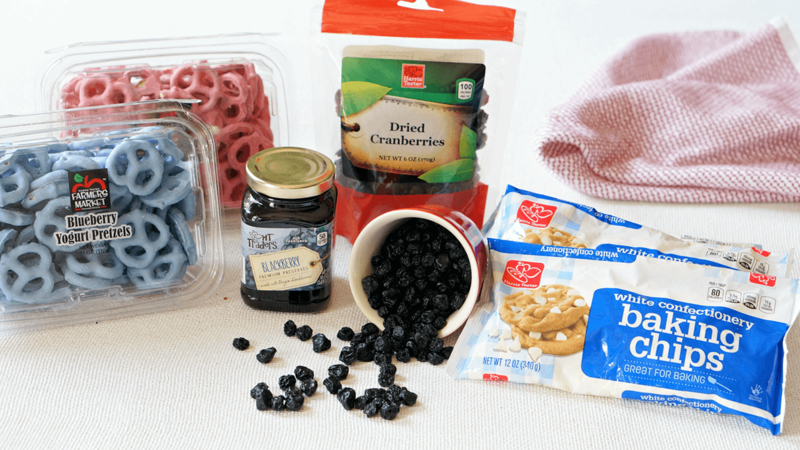 Loaded with all things delicious - yogurt covered pretzels, berry jam, and dried cranberries and blueberries, it’s a snack the whole crowd will dig. Bring it to your potluck or pack it up to enjoy with the fireworks! In a large microwavable safe bowl, cook the white baking chips for 1 min. Stir, then return to the microwave and cook in 30 second intervals, stirring in between. 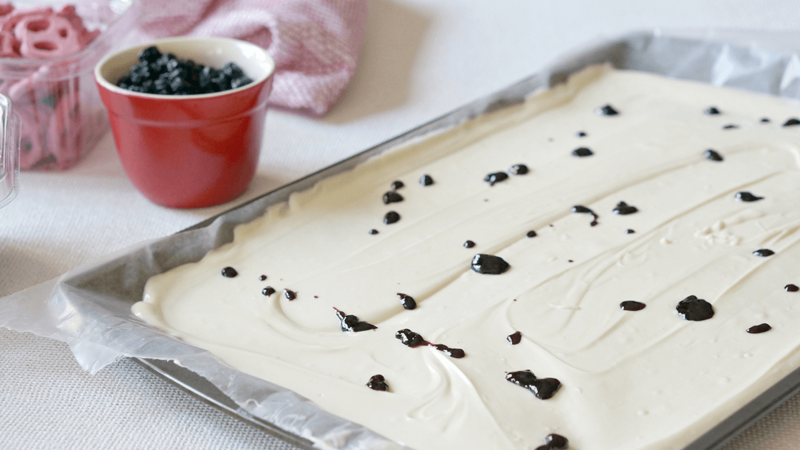 Once smooth, pour the mixture out onto a baking sheet lined with wax paper. Put the jam in small microwavable bowl and heat for 15 seconds. Dollop over the chocolate. Using a toothpick swirl the jam in a decorative pattern. While still warm, lightly press pretzels and berries into the chocolate. If desired top with sprinkles. Allow to cool completely before cutting. Store in the refrigerator up to 3 days in an airtight container.